Brian, the owner of Caveman Bodeez, reached out to us a few months ago. He provides slot car bodies and resin accessories for retailers and consumers. Up to this point, he has mostly been doing mail order with a large catalog that he sent to customers. But, he wanted to take the business to the next level and create an online catalog that he could update and allow customers to see what is available without needing to send out large catalogs. We created the initial site for Brian and he took over to start adding in his items. While he was working to add his items, he was very surprised at how user friendly the website editor was and has been working to get the catalog posted. While his website doesn’t allow payments, he does allow individuals to add items to the cart and checkout – which generates a quote request. We appreciate the business from Brian! 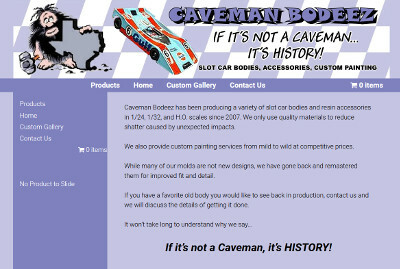 Caveman Bodeez website is at cavemanbodeez.com.